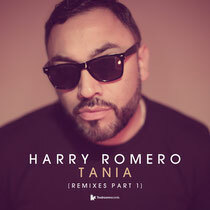 Toolroom Records recently released the first in a two part collection of remixes of Harry Romero‘s, ‘Tania’, including remixes by Riva Starr, Purple Disco Machine and Filterheadz. Raised on Latin rhythms and classical concertos, Harry’s soulful approach to house music has won him the respect of fans and fellow producers alike. Motivated by his love of music, he is constantly striving to perfect his productions and DJ sets. A respected name within the dance music community, Harry Romero’s ‘Tania’ was and possibly remains an Ibiza anthem, sounding as fresh today as it did 13 years ago. ‘Tania’ has now been brought back to life with new mixes from some of today’s hottest producers: Riva Starr provides a crisp and clean update, Purple Disco Machine introduce soulful textures for an addictive take on the original; whilst tech producers Filterheadz deliver their own version of ‘Tania’, crafting a huge remix, driving for the darkest dance floors. It’s an eclectic set of remixes by artists paying homage to Harry original productions. Look out for forthcoming ‘Tania (Remixes Part 2)’. Check it out below.